Celebrities are sales drivers who strongly influence consumer engagement. We believe Nike's edition of LeBron James and Michael Jordan shoes will enhance our skills on the court, and how many of us are using Proactiv acne treatment because Jessica Simpson and Katy Perry said so? But just like the crises of Paula Deen and Lance Armstrong, celebrity endorsers and their corresponding brands can find themselves in a publicity nightmare through a bad decision or simple oversight. However, marketers should not avoid investing in a celebrity partnership due to fear of the unknown. There are absolutely ways you can protect yourself. 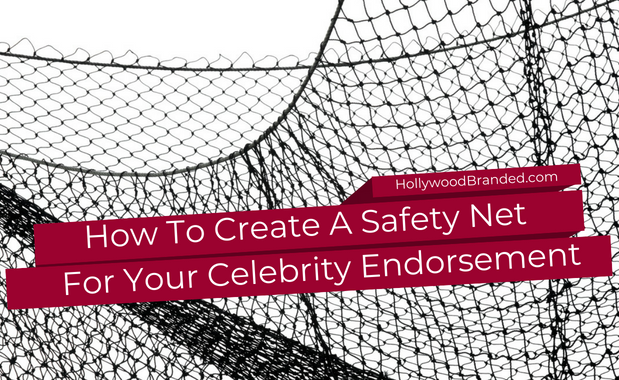 In this blog, Hollywood Branded takes a look at how to create your own brand's celebrity partnership safety net in order to be successful - and safe. When investing in celebrity talent to endorse a brand, it is essential that the brand manager not only optimize the opportunity with a detailed plan in place prior to activation, but also have the forethought to safeguard against potential blunders that could occur. Prior to making a celebrity hire, there are a few important things to consider. First, you want to make sure your chosen endorser actually understands the brand and the ultimate marketing goals of the company they are representing. Having your chosen celebrity actively engaging with the brand management team will equip them with the necessary information and responses to appropriately address media opportunities that come their way - whether in a formal interview or a casual conversation on the street. There is also a concern of whether or not your brand's endorser actually uses your product in "real life." Your chosen celebrity endorser may have been using a competitive brand before being signed on. Educating your endorser on the specific benefits of your brand and the elements which set it apart from competitors is not only helpful in establishing consistency, but you increase the likelihood of that celebrity organically adapting it into their personal lives, increasing the chance of their daily use and loyalty to that product. In addition to celebrity endorsements, many brands are investing dollars in event sponsorships and TV and film integrations. What would happen if Pepsi endorser, Beyonce Knowles' next film role called for her to drink copious amounts of Dr. Pepper on screen? With all the potential events and project sign-ons available for your celebrity to join, a conflict of brand interest is likely to arise. Ensure you have exclusivity with your endorser, and have a plan in place for what should happen when the celebrity is booked on productions or events that may have partnered with a competing sponsor. After being secured for three different mobile brands, Alicia Keys and Ellen DeGeneres both blundered when they tweeted from their personal phones, which were different manufacturers than their new endorsement partners. Everyone remembers the 'epic selfie' Ellen took with Samsung's Galaxy phone and how present the brand was on-screen throughout the Oscar telecast. However, if you checked out Ellen's backstage tweets detailing the show, all were sent from her personal iPhone, not the Galaxy phone Samsung paid such a hefty price for her to be seen with. Companies should do a bit of behind the scenes investigating to see where any conflicts may occur, now and in the future, and address them immediately. Just as you've finally completed prepping your endorser, researching and resolving all possible conflicts and ensuring exclusivity of your brand, a not-so-good news story involving your celebrity pops up on the cover of this week's top tabloid. Bad news in the entertainment industry spreads faster than a wildfire. In today's nonstop-posting, always tweeting, over-sharing world, you must have a crisis plan in place to manage true PR horror stories that will allow your brand to respond in an effective and timely manner. Celebrities can find themselves in hot water through bad decisions. Their mistakes, unlike the rest of us, get broadcast around the world for all to see. Drunk driving, trouble with the law, relationship issues, or negative comments picked up by paparazzi can all derail a campaign if a plan is not in place to respond quickly to the matter. When LeBron James tweeted negatively about his Samsung phone - forgetting the brand was a key sponsor of the NBA, the crisis was somewhat averted soon after by having him quickly send a follow up post stating it was a false alarm. If the celebrity blunders and says or does something specifically negative towards the brand, the brand team will need to address it quickly, that day - even that hour. So you've found the perfect endorser for your brand, but does your target consumer adore that celebrity as much as your company does? Be sure not to put all your eggs in one basket! Don't let YOUR perfect celebrity be the only representation of your brand. While people realize that celebrities are not actually the brand they are the face of, consumers are less likely to judge or discriminate against a product if there is a mix of celebrities engaged with who they can relate to, aspire to or emulate versus a single one. A brand endorsers' job description is not to simply show up and smile for the cameras, it's a partnership that needs to be worked seamlessly into their everyday lives to ensure success for everyone. It is up to the brand manager to make sure the celebrity understands and supports the larger picture of the brand, its current goals and its future. Celebrities are one of the global powerhouses – and they can make a brand’s sales go sonic overnight with the right campaign elements to support the partnership. These can include TVC’s (television commercials), print ads, radio and retail store displays – and nowadays, lots and lots of social media. Are you interested in learning how to successfully partner celebrities to your brand - without spending a million? 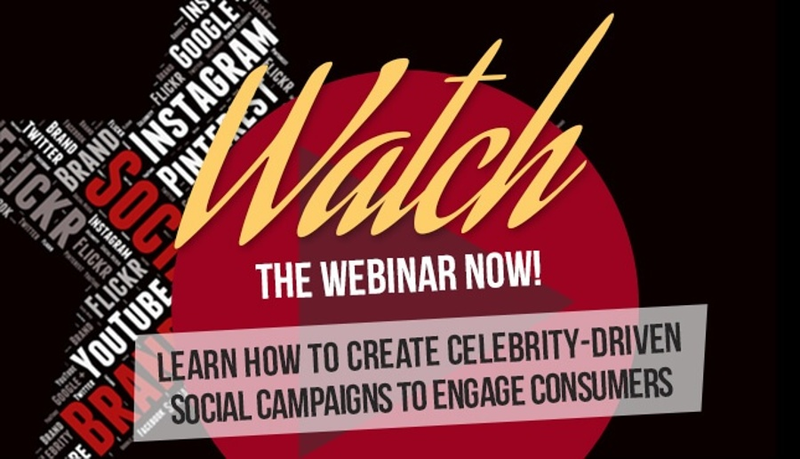 Watch this short webinar to learn Hollywood insider tricks to create and kick start an entertainment marketing campaign that is the perfect extension for your social media program.